We have been consistently promoting sport at Flame because we believe that it’s a smart way to connect with young people in a way that will help them both on and off the field. This is not just a hunch! As I have dug into UN documents and research about sport as a tool to help at risk communities, I have found a clear link with improved academic outcomes. Literacy is absolutely necessary to becoming a leader, and slum living kids becoming leaders is what Flame is all about! High school enrollment in Cambodia sits at 57%*. Participation in sport has been shown to have a direct relationship with a more positive attitude toward school work and improved academic performance. These academic factors are important predictors of future educational attainment and occupational success. This is what is necessary for sustainable development. Flame wants to see long term impact in these communities and this is one proven way of achieving that. 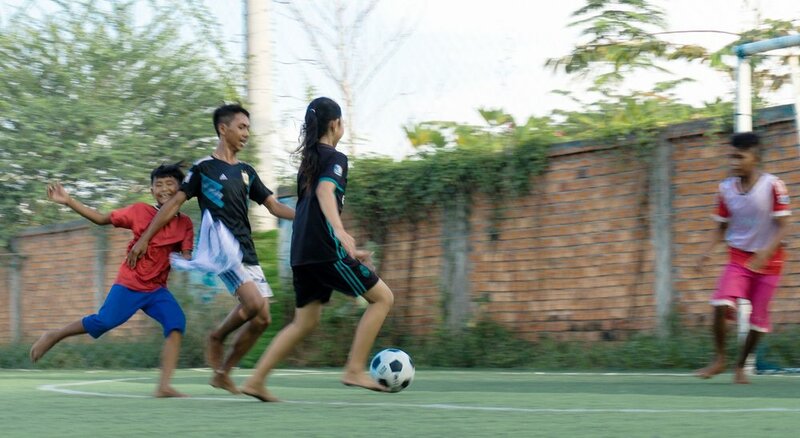 The 2030 Agenda for Sustainable Development states that sport contributes to the empowerment of communities as a while and particularly, to the empowerment of youth. Recently the UNODC (United Nations Office on Drugs and Crime) also linked sport with life-skills development and crime prevention. Being part of a team promotes inclusion and creates a positive sense of well being among the players. Football is a popular pastime among the slum living kids and has a wide reach -we don’t need to recruit kids or twist anyone’s arm to play. So this is why we have a focus on football! We need your help to keep the teams afloat, buy gear and pay the field costs. These kids need boots! Please help them by donating using the button below. Just click and donate.